Alan Romanczuk, part of Team Jordan and assistant to Robert Jordan, has been working feverishly on the forthcoming The Wheel of Time Companion, due out this fall. For a while, he was spending a lot of his time compiling information on Trollocs. The team was under a lot of stress, and so Alan found his way to a masseuse with "shaman abilities" (a woman unfamiliar with WoT) who often reads people's auras. As she looked at Alan, she said she could see around him strange, frightening creatures. Apparently, the Trollocs had followed him out of the office. 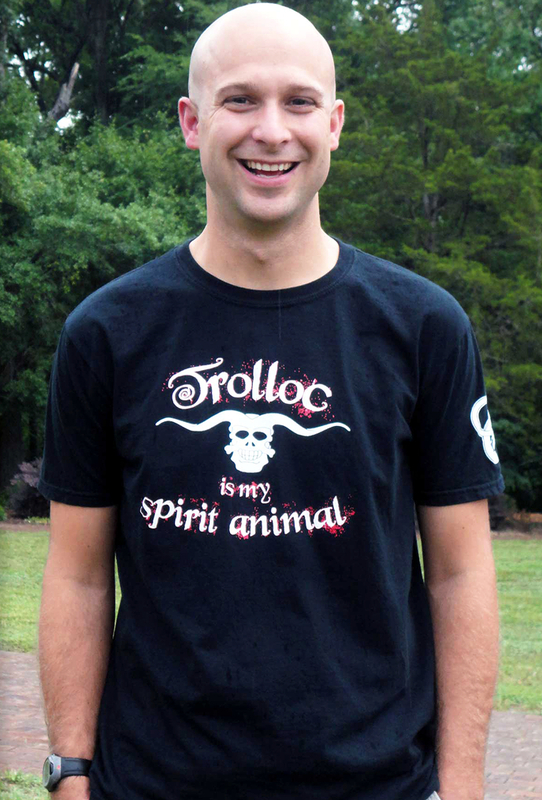 Of course, once this story was relayed back to us at Ta'veren Tees, we felt it was only appropriate Alan had a shirt declaring his spirit animal is a Trolloc. His shirt went over well with Harriet and the crowd at JordanCon, and the rest is history. The "Spirit Animal" shirt is 100% preshrunk, lightweight cotton and available on an adult unisex tee. Preorders will ship as soon as it is ready by June 30th. All other items (except costumes, jewelry, and art of Paul Bielaczyc) ordered at the same time will be held and shipped at the same time as the preorder item. In honor of Father’s Day, you can also use coupon code TAMLIN15 for 15% off your entire order at www.TaverenTees.com (www.TheWheelofTimeStore.com), good through June 21!